A drusy quartz necklace is a highly individual piece of jewelry. Drusy quartz has a sparkle which is encased often in a neutral tone that makes this an ideal option for lovers of unusual jewelry. Drusy quartz is the name given to crystals that form on the inside of a mineral cavities. They form on different minerals; most commonly quartz. The tiny drusy crystals are similar in appearance to granulated sugar. When drusy quartz is cut and polished it makes an ideal stone for use in jewelry. Drusy quartz is sometimes treated to add a depth of color to the stone. Untreated pieces of drusy quartz are often found in neutral tones, however deeper shades are also found occasionally and are highly prized. Drusy quartz is not expensive and this means that it is a popular choice with independent jewelry designers. Drusy quartz necklaces are one of the most popular types of jewelry using this unique stone. Silver settings - drusy quartz is often set in silver. The cool white of sterling silver provides a beautiful backdrop for the unusual features of the stone. The style of setting depends on the design of the jewelry. Popular settings include rub-over settings which encase the drusy quartz in silver or prong settings where prongs are used to hold the stone securely in place. Cut - one of the most attractive aspects of drusy quartz is that it is available in many different shapes and sizes. The stones are often hand cut and the gemstone cutter uses their skills to cut the stone to show off the unique features to their best advantage. This means that as well as being available in standard shapes and sizes, drusy quartz is often available in unusual shapes and this is ideal for unusual and custom jewelry designs. Other stones - some styles of drusy quartz jewelry feature a combination of gemstones. Other types of gemstones are chosen to complement the cut, shape or color of a drusy quartz and this can make a stunning piece of jewelry. 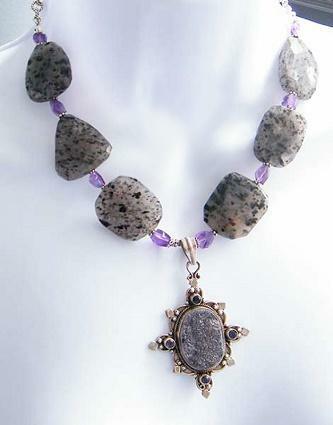 Some designs of drusy quartz neckpieces combine gemstone beads with a drusy quartz pendant. Jewelry sets - an attractive way to buy drusy quartz jewelry is to look for necklace and earring sets. Cluny Grey Jewelry offers a range of different drusy jewelry designs, including necklaces, bracelets and earrings. JeJems - The range of jewelry available from this website includes some interesting artisan made drusy quartz pendants and necklaces. 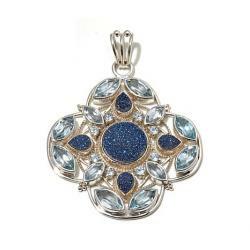 HSN - There are many types of drusy jewelry available from this website, including some unusual pendants. In addition to the websites listed above, online handmade crafts marketplaces such as Etsy and Artfire also have a wide range of drusy quartz items to choose from. These are typically one of a kind pieces and are therefore unrepeatable. This is also a good way to make contact with artisan jewelers who may be happy to make a piece of drusy agate jewelry for you on commission. A piece of drusy quartz jewelry, such as a necklace or pendant, can make a great addition to a jewelry lover's collection. Each piece is highly individual, making it a great choice if you are looking for something that is both unusual and stylish.